The Malleo Sprint light is an innovative orthosis with excellent biomechanical properties. 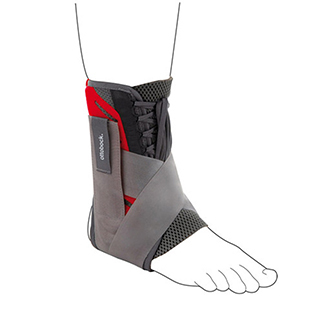 It is the best therapy choice for chronic ligament instabilities and stabilises the ankle reliably. Foot eversion and inversion are restricted without negatively affecting plantar and dorsal flexion of the foot. When closed, the Malleo Sprint light ensures targeted and stable support and limits motion. The wearer comfort of the Malleo Sprint light is achieved by the anatomical shape in the malleolar area and by using the special 3-D spacer fabric SpaceTex. The breathable SpaceTex material provides comfortable padding and transfers heat and humidity away from the body. Unwanted pressure points are prevented by the reduced thickness of the base material under the foot combined with highly comfortable padding.